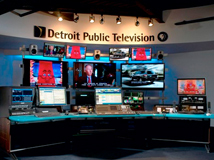 Arab American Stories is an Emmy Award-winning 13-part series presented by Detroit Public Television that explores the diversity of the Arab-American experience. The series was produced by Alicia Sams (who was also the producer/director of the Emmy Award-winning film By the People: The Election of Barack Obama) and is hosted by NPR’s Neda Ulaby. Each half hour features three short, character-driven documentaries produced by a variety of independent filmmakers which profile Arab Americans making an impact in their community, their profession, their family or the world at large. Each week we will meet 3 different Arab Americans whose stories are juxtaposed around a particular theme. The series features people of all walks of life whose stories illustrate the Arab-American experience: artists, scientists, musicians, chefs, actors, entrepreneurs, police officers and educators. For example, we may meet an Arab American butcher whose dedication to his work and family inspired a local theater company to write a performance piece about him. Then we may meet an Egyptian/Polish/American writer who mines her multi-cultural experience for a coming of age novel, or the Lebanese-American cousins who invented the Swarmatron, an electronic instrument which was used on the Academy Award-winning soundtrack of The Social Network. Arab American Stories was shot all over the country by a team of talented filmmaker/producers who brought their varied experience to the stories. The stories feature Arab Americans of all walks of life who are having an impact – on their communities, their families, or the world at large. Educators will find this series a useful, engaged, learning tool for secondary student populations. These lesson modules explore themes that resonate with individuals from diverse backgrounds. Thematically, Arab American Stories may used as an innovative approach to discussions around: Immigration; Origins; Citizenship; Civil Rights; Race; Inclusion/Exclusion; Community; Culture; Local/Regional/National/Global; and Unity and Diversity. ©2011-2019 Arab American Stories. All Rights Reserved.